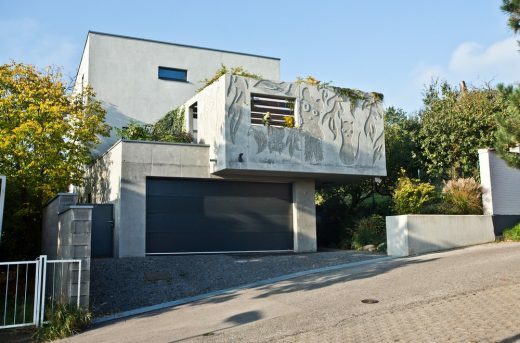 Despite the fact that many architects understand their houses as a manifesto of their ideas about architecture and they are trying to implement everything they did not pass by their clients, architect Igor Lichý chose a rather conservative approach. An important criterion was the timelessness. This was reflected in the “Modernistic” design, which he hopes will be actual in several years. Another criterion was the constructional simplicity. This resulted in simple shapes without complicated details. 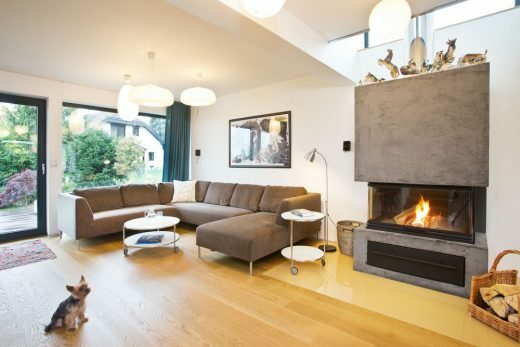 They used classic materials with an emphasis on durability, as burnt brick, mineral wool and minimum of plasterboard. Great emphasis was placed on the functionality so that house can adapt to any changes in the family. 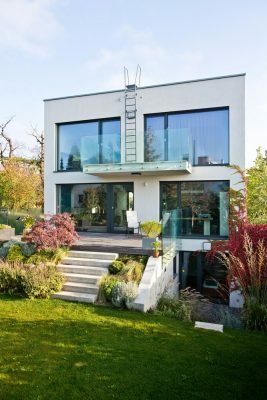 On the ground floor he created a guest room with barrier free access and contact with the garden, which may in the future serve as a separate dwelling unit for either parent. Since the land has only 4.7 ares architect tried to make the best use of it. 13 meter width of land allowed placing two full rooms on the parcel. Another criterion was the climatic conditions. Instead of orientation of the terrace for sun, architect decided to situate the terrace to the north. The sun is pleasant in the spring and fall, but in the summer one wants to hide before it. North terrace is connected to the kitchen and towards the street. 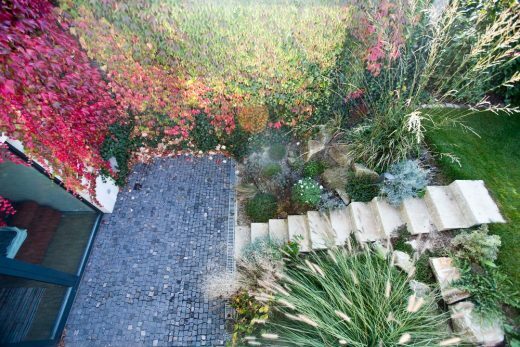 The need for privacy caused that terrace turned into a semi-enclosed patio, which in hot weather really serves as another microclimate. 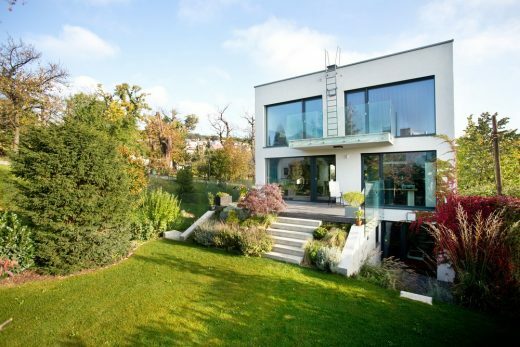 Other rooms of the house are oriented to the garden for maximum contact with nature. 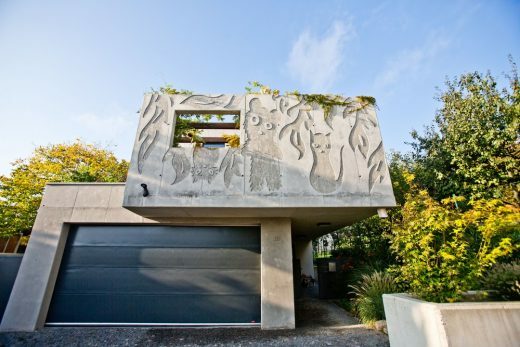 For structural reasons, the front part of the house (garage and a patio) is made of concrete. 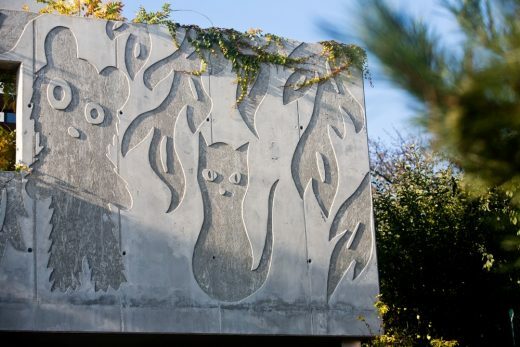 Architect contacted the well-known graphic Peter Bařinka, who portrayed cheerful designs of animals in the architectural concrete. 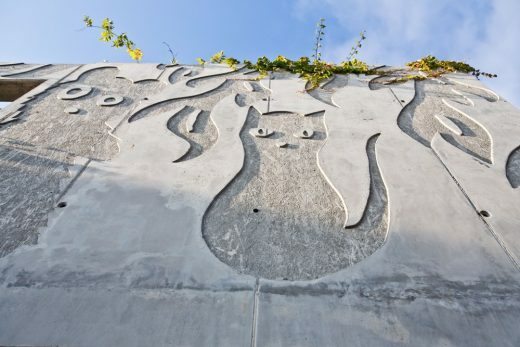 „Often it happens to me that when peeking out from the yard into the street, I catch the occasional passers to have fun on the infantile drawings and I get happy, “laughs the house owner. In the day part of the house is a window above the fireplace that illuminates the center of the house, as it is quite deep and without it, there would be gloomily. 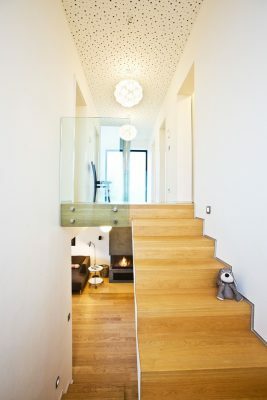 In the middle of the house is a small gallery connecting upper floor with the ground floor, which also serves for lighting up the whole space. The bathroom has two windows, one due to quality daylight above the mirror and another to the east sun. Wardrobe has the window to be seen true colors of clothing. The kitchen has a window to the herb garden and the street. 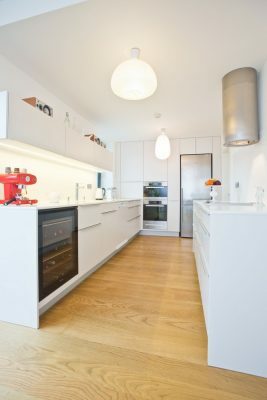 For practical reasons, the kitchen is not fully connected with living room, but only partially. Daily life brings to the kitchen a little mess and it is not good when it’s too much on the eyes. The interior of the house is not yet fully furnished. 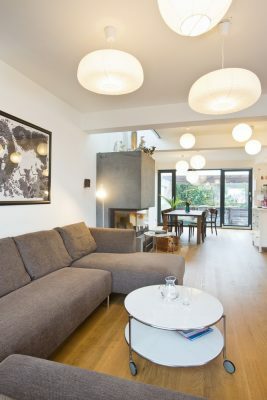 According to the house owner, interior should arise gradually from the collection of items that appeal to a person in life and not one-stop shopping in the showroom. It is also necessary, taking account of experience of everyday living in the house, which may only be obtained by habitation.